We are happy to welcome Dianna Barrie and Richard Tuohy for a night of 16mm magic! Cinema was the first inescapably mechanical art. But in this post-mechanical age, the traditional apparatus of cinema has all to rapidly been deemed obsolete and primitive. 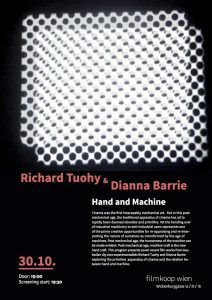 Yet the handing over of industrial machinery to anti-industrial users represents one of the prime creative opportunities for re-appraising and re-interpreting the nature of ourselves as transformed by the age of machines. Post mechanical age, the humanness of the machine can be made evident. Post mechanical age, machine craft is the new hand craft. 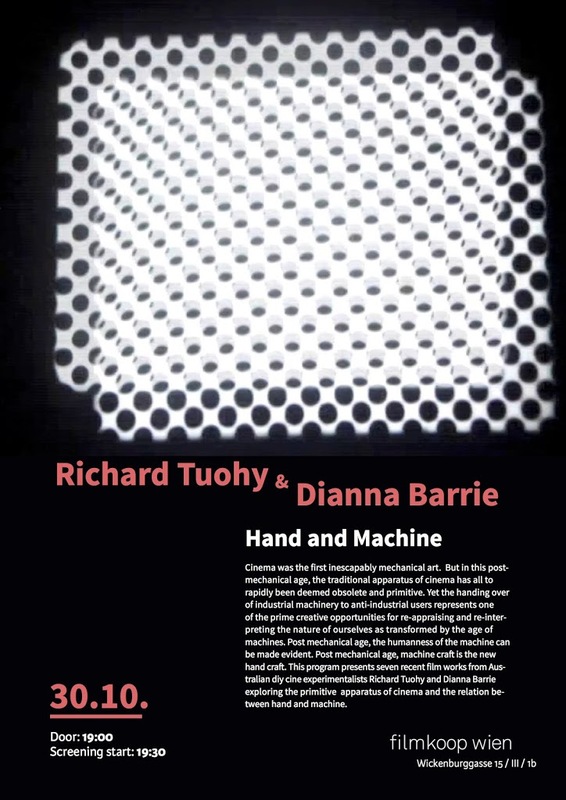 This program presents seven recent film works from Australian diy cine experimentalists Richard Tuohy and Dianna Barrie exploring the primitive apparatus of cinema and the relation between hand and machine.